Once you graduate from university, you will be faced with a competitive job market. The trick here is to know what application and interview process that you are going to face so that you can be fully prepared. One of the most common ways of narrowing down the application pool is through the use of graduate aptitude tests, which test the verbal, numerical, and abstract reasoning of applicants. These tests are popular in a wide range of industries, from banking to technology. It is, therefore, beneficial for you to know about graduate aptitude tests. 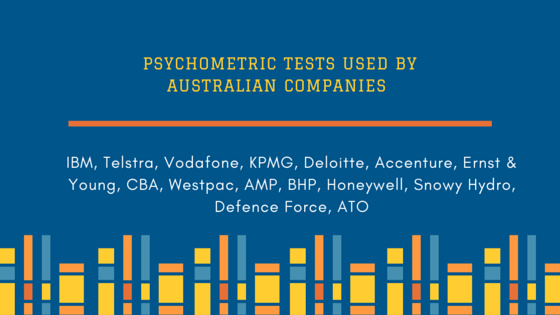 Below we will detail the companies in Australia that make use of psychometric testing in their graduate programs. This way you can know ahead of time what you will encounter if you apply to one of these companies. – IBM: IBM is a global technology company that has been operating in Australia for over 80 years. This company is quite diversified, but you will find that most of its projects revolve around technology and innovation applied across different institutions and enterprises. IBM makes use of an online aptitude test which is only valid for a one year period. After that, you will need to resit the test if you want to apply to the company again. While many Australian companies use testing companies like Revelian and SHL, IBM uses their own aptitude test known as IPAT. Find out more about IBM’s IPAT test here. – Telstra: Telstra is the largest telecommunication company in Australia, providing mobile phones, home phones, mobile devices, and broadband internet to the wider population. Telstra makes use of Revelian tests, mainly the cognitive ability test and the personality questionnaire. Check out Telstra aptitude tests practice. – Vodafone: Vodafone is another leading telecommunication company in Australia. Vodafone makes use of SHL psychometric tests for its graduate programs. Access Vodafone aptitude test practice now. – KPMG: KPMG is a network of firms around the world, each of which provides advisory, tax, and audit services. This company makes use of SHL numerical, verbal, and logical reasoning tests. Additionally, they use Deloitte is a company that specialises in providing audit, human capital, financial advisory, economics, tax and technology services. This company uses a 20-minute cognitive reasoning test for graduates who are applying for its entry level positions. – Accenture: Accenture is a professional services firm, which focuses on outsourcing and consulting services. However, to work for Accenture you will first need to take a 20-minute CEB’s SHL test. Access Accenture aptitude tests here. – Ernst & Young: Ernst & Young is a leading professional services firm, which offers assurance, legal, tax advisory, financial advisory, and consulting services. This firm uses the SHL test for graduate programs. When it comes to the banking, finance, and insurance industry, you will find that most applicants are asked to complete an online assessment test in advance. The test results will then determine which applicants are chosen to take part in an assessment event after a phone interview. – NAB, ANZ: These 3 Australian banks make use of the SHL online assessment. This assessment has a logical, verbal, and numerical section. – Westpac Group: Westpac Group includes Westpac bank, BankSA, St George Bank, BT Financial Group, RAMS and Bank of Melbourne. The banking and financial institutions in this group make use of a personality questionnaire, a cognitive ability test, and the Revelian Theme Park Hero test. The latter is a fun psychometric testing game, where the speed at which your mind can shift from one concept to another is tested. – AMP: AMP also makes use of the Revelian Theme Park Hero test described above. – BHP Billiton: BHP is the world’s largest mining company. This multinational company uses SHL tests for graduates, more specifically numerical reasoning, logical reasoning, and verbal reasoning tests. – Honeywell: Honeywell is a technology company that uses Revelian test for graduate programs. – Snowy Hydro: Snow Hydro is an electricity generation and retailing company, which uses SHL tests for its graduate programs. Private companies are not the only ones that utilise graduate aptitude tests, the Australian government also uses these tests to screen graduates during the application process. Australian government graduate programs have a range of disciplines that fall across different government agencies. These agencies range from agriculture and defence to social services and treasury. Here is a list of some agencies that employ graduate aptitude tests. – Australian Defence Force: Let us begin with the Australian Defence Force, which uses aptitude tests during the online testing process and during the assessment centre day. The online test focuses on cognitive and analytic abilities, while the assessment centre aptitude test will focus on problem-solving skills, communication, resourcefulness, and technical proficiency. Practise ADF Aptitude Test here. – Department of Finance: The Department of Finance uses online exercises that cover comprehension, analytical, and written skills. The results of this test will determine whether or not you will take part in an assessment centre. – Department of Health: The Department of Health makes use of Elements Online Ability Assessments, which are composed of several ability tests. These tests will focus on your reasoning skills, in relation to interpreting reports and written information. The tests also involve numerical and logical reasoning, mainly figures, statistics, data, abstract symbols, and logical symbols. If you pass these online ability assessments you will take part in a phone interview and thereafter an assessment centre. – ATO (Australian Tax Office): Last but not least we have the ATO, which uses Revelian cognitive tests. In addition, the ATO makes use of a psychometric test which is game based. As you can see, the use of graduate aptitude tests is widespread. The companies and government offices detailed above are the most prominent institutions that we could name, however, there are many other smaller institutions that use this testing. We would, therefore, advise you to do your research in advance so that you can know what to expect. Visit this page for pre-employment assessment tests & information from different employers. Well thanks, a ton of information I supposed. I have to read it 4 times to comprehend all the points and ideas on this post but it is worth the reading. Can you please explain more about the consulting industry, I prognosticate that it will be boomed pervasively and I’ve got to catch up with the tendency, haven’t I? ndut, a consulting job is where you work as a consultant on a client’s business to solve their problems in the industry that you have the expertise in. There are consulting jobs in almost all industries such as finance, accountant, IT. Thanks very much for the very comprehensive list.